Black Panther, as an idea, has persisted in our imaginations for well over a year. More than just dominating conversations, the film’s mere existence, its possibilities, and its rare cast of gifted dark-skinned black people, allowed us to fantasize. 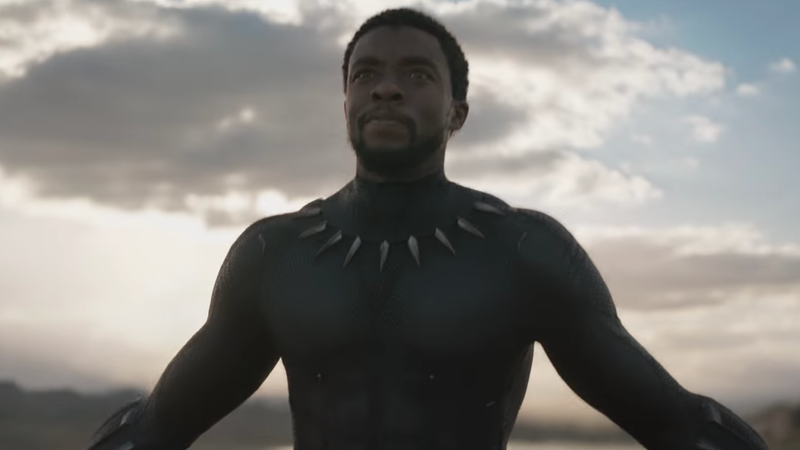 The Marvel world of Wakanda, though it’s been around for over 50 years, could only become fully formed through the medium of film, where the legend of T’Challa (played by Chadwick Boseman), the black panther and king of a flourishing African nation, could be rendered richly, in multiple dimensions, with overlapping themes—of identity, country, and ancestry—circling about him. Black Panther is an origin tale in a dual sense, the beginning of a new Marvel chapter and the creation of a world we want to be part of, set in a physical space in which many of us already belong. Even if you don’t know the story of Black Panther from the comics, as I hadn’t, director Ryan Coogler and his crew—including costume designer Ruth E. Carter, hairstylist Camille Friend and DP Rachel Morrison—succeed in the type of world-building that educes sensation. There are enviable hair styles and clothing that breathes, visual effects that illuminate Wakanda’s mountains of richness and innovation. It’s fitting that the brilliance of a black woman, the tech prodigy Shuri (Letitia Wright), who also contributes much of the movie’s levity, has turned Wakanda into a self-sustaining digital nation, unbeknownst to the rest of the world, which thinks of and refers to it as a Third World country. In conceiving Marvel’s all-black space, Coogler has more than met a tall task. He’s constructed a superhero epic about the power of preservation in which a nation fights to retain the very idea of itself. He’s imagined a familiar story about a black family in which the consistent point of inflection, even in their pursuit of unity, is a sense of separation. He’s conceived a tragedy about native rituals, colonized minds, and absent fathers, with nods to the visible stamina of black matriarchs, led by the queen, Angela Bassett. The idea that outsiders plant noxious seeds that lead to communal factions warring against each other subsists with the idea that the ultimate challenge in life is the fight with your own Kin. Rather than stretching itself thin, Wakanda has folded inward and secluded itself to preserve its secret trove of vibranium, the world’s most precious resource. What sets off a ricochet of events at the start of the movie, set in 1992 Oakland at that point, is an act of betrayal between T’Challa’s father, King T’Chaka, and his brother Prince N’Jobu, played by America’s most masterful emoter, Sterling K. Brown. T’Chaka is obligated to his country but fails to make a clean break and, in his actions, he leaves a child behind who becomes the story’s villain, Killmonger (Michael B. Jordan). Black Panther distinguishes itself from other Marvel movies by granting its characters deep-seated motivations that extend past borders and generations. The Wakanda leaders, in step with their inclination to protect the country’s vibranium reserves from the Colonizers, also know from history and experience the power of black ownership. The idea that outsiders plant noxious seeds that lead to communal factions warring against each other subsists with the idea that the ultimate challenge in life is the fight with your own kin. T’Challa then has to salvage his country, lest it be lost to an adversary less worthy, Killmonger, who threatens the foundation of peace and isolation on which Wakanda was built. Jordan’s portrayal of darkness (which he occasionally oversells but looks extremely good doing so) illustrates what a Marvel villain can be at his/her worse, driven not by greed or destruction, but belonging and resentment. That Killmonger is African by creation yet American-bred introduces extra layers. His base motivation is to take the throne from T’Challa. And while his strategy is emotionally wrought, the structure of the idea itself—to spread Wakanda’s wealth and colonize the world with blackness—proves sound. Stripped of his own history, he’s a boy unbalanced who tries foolishly to be king. To say nothing of the women of Wakanda would be a crime. They are meant to captivate us, in their wit, beauty, and movements, which seem easy to the naked eye. They do the work of natural protectors. There were several times I felt chills seeing Danai Gurira, as the warrior General Okoye, channel the effortless force of Michonne in battle, and Lupita Nyong’o, as T’Challa’s love interest Nakia and a warrior in her own right, boldly correct course throughout the narrative. Their roles exist as part of a larger trend of black women beginning to infiltrate superhero franchises—Tessa Thompson in Thor: Ragnarok, Zazie Beetz in Deadpool 2, Dewanda Wise in Captain Marvel. No doubt, it’s a play for profitable representation on the studios’ part, but the trend also reveals in itself something bigger—the black audience’s yearning to be to be linked to a place. As a film, Black Panther flows like a good conversation, and what we’re left with is even more to talk about.